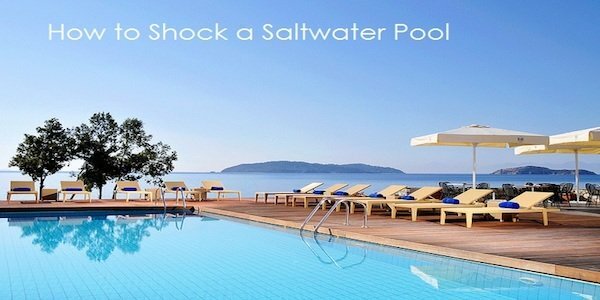 Introduction – What is Saltwater Pool Shocking? Saltwater pool shocking is one of the most important pool maintenance practices. This article discusses what shocking a saltwater pool means and how to shock a saltwater pool. The term shocking here refers to the process of hyper-chlorinating the pool in an attempt to clear out excess dirt, germs and even algae. In order to achieve the required concentrations, you will have to add three to five times the amount of salt you use depending on the size of the pool and the amount of dirt accumulation. Also depending on the type of salt water chlorinator you are using, you might have to turn up the power for faster and more efficient chlorination. Salt water pool shocking is done every once in a while to figuratively and literally shock the dirt and unwelcomed biological guests and give the pool a nice fresh start. Read on to learn a little bit about how to shock a saltwater pool. The main reason why shocking of salt water pools is necessary is in order to get rid of bacteria and algae that ordinary salt concentrations are unable to take care of. This is important and it works because over time, bacteria and other living organisms become resistant to the ordinary chlorine levels. Pool shocking also helps clear organic matter that accumulates and coats the surface of chlorinator systems over time. Having understood what saltwater pool shocking is and why we do it, it is also important to understand how to do it. Below are five tips on how to make the pool shocking practice a lot more effective. In order for the pool shocking to be successful, you need to clear the pool of all potential contaminants. Scrubbing the pool and removing all debris should therefore be done prior to the pool shocking. UV rays from the sun break down chlorine making the saltwater pool shocking process much less effective. It is therefore advisable to do the treatment when the sun has set to give the chemicals enough time to work before the sun rises again. If you are working with an indoor pool or spa facilities, the timing doesn’t matter much especially if there is a way to block out sun rays. Pool shocking is done using specially concentrated chemicals known as pool shock chemicals. When you are working with salt water pool chlorinators, it is important to have their unique mode of action in mind while making the decision of shock chemicals to use. It is advisable to use chlorine salt based chemicals that can be broken down by the salt cell to liberate the chlorine for effective hyper-chlorination. 4. Pour the shock mixture at different spots in the pool. With pool shocking, the chemicals themselves are effective even without having to go through the salt cell chlorinator. It is therefore advisable to pour the mixture at different spots all over the pool and allow the chemicals to diffuse and equilibrate. 5. Avoid using the pool or spa facilities for a while after the shocking process. This is an important tip to consider for two reasons. The first is that use of the pool just after shocking renders the process null and void as it introduces contaminants to the water. The second reason is that the high levels of chlorine pose a health risk to users including skin and respiratory system irritation. To be on the safe side, monitor the chlorine levels regularly and allow people to use the pool only when the acceptable levels are attained. Shocking of saltwater pools is without a doubt a very necessary pool maintenance practice. The tips above should help make things a lot easier for you for an effectively sanitized pool and given you a little knowledge on how to shock a saltwater pool. Just make sure that the shocking treatment is done on a regular basis for the sake of your pool system and those who are going to use the pool.